Earths climate changes rapidly and here’s something you should know what comes to your dog’s food. 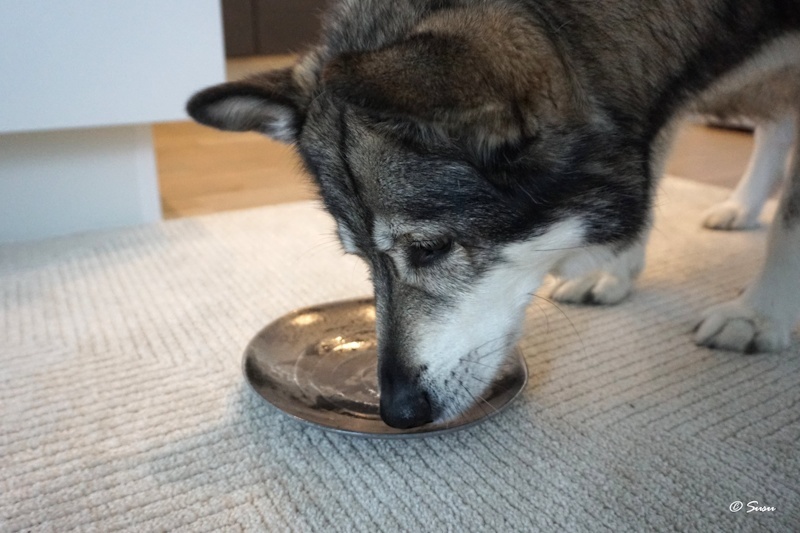 Although many dogs like vegetables, their digestive system has evolved to digest meat so plants like soy and grains mostly pass straight through. Dogs need meat in order to get all the protein they need from their food. Nowadays some pet food brands sell vegan foods for dogs but there’s no way dogs get all the nutrients they need from vegan food. Their digestive system is much shorter than humans’ so they can’t get all the nutrients from vegan food - although humans can. Earths climate changes rapidly. Climate change causes extreme weather conditions, such as extreme heat waves, extreme cold, drought, heavy rains, more devastating hurricanes and floods. The diversity of animal species is diminishing due to mass extinctions. Humans need to change their habits fast in order to slow down and reverse climate change before it’s too late. Meat and dairy causes over a fifth of all greenhouse gas emissions in the world. This is more than all the traffic in the world combined (such as. cars, trucks, airplanes, boats, train etc.). Consumption of red meat (such as. beef, pork, lamb, goat) and cheese accelerates the climate change more than anything else. Poultry and fish has lesser effect - about 25% compared to red meat and dairy. So you could cut your emissions quite a lot by changing red meat and dairy to poultry and fish. Fish meat is nowadays full of micro plastic so I would recommend not to have that at all. In addition, scientist say that if we continue to consume fish as we do now - all fish species are extinct by year 2048. That is less than twenty years. Farm animals cause climate change in many different ways. Cattle produce massive amounts of greenhouse gasses and their manure pollutes our water. They need large areas to graze and that’s why people need to cut down rainforests in an accelerating pace. When a forest is cut down, all the carbon emissions stored in trees are now being released in the atmosphere. Rainforests are the lungs of earth and they naturally remove carbondioxide from the air which slows the climate change. Cutting those forests accelerates climate change. Farm animals use now 25% of all earths surface, and that percentage is growing rapidly. You may think that buying only domestic food your consumption won’t influence the rainforests but unfortunately you are wrong. Farm animals all over the world are often fed with feed that is produced in those used-to-be-rainforests. There is great hunger in the world and many people don’t have access to clean water. Farm animals uses a third of all fresh water in the world. Producing a single pound of meat requires about 2000 US gallons of fresh water and about 10 to 15 pounds of feed that humans could eat, such as soy and grains. Many of us thinks that organic food is somehow pure and ecological. Organic food can be even more harmful than regular food. For example they need to use more toxic pestisides because it’s “natural” compared to artificial pesticides that are less harmful. Organic labeled meat products come from animals that may have been sick, because in order to be “organic” they can’t use medication such as antibiotics when the animals are sick. Unfortunately there have been countless of cases like this where companies have been caught slaughtering sick animals for food in order of being “organic”. They feed those sick animals to humans as well. And a fact is that an organic cow produces just as much of greenhouse gasses than a regular cow. As I wrote earlier dogs need meat in order to live well. This is where everyone of ourselves need to think what type of meat we feed to our dogs. I try to select turkey and chicken as much as possible for Miki instead of red meat. Most dog food brands have a wide selection so you can ditch red meat and choose poultry instead. And because Miki’s food produces lots of greenhouse gasses, we compensate that by eating only vegan food ourselves. 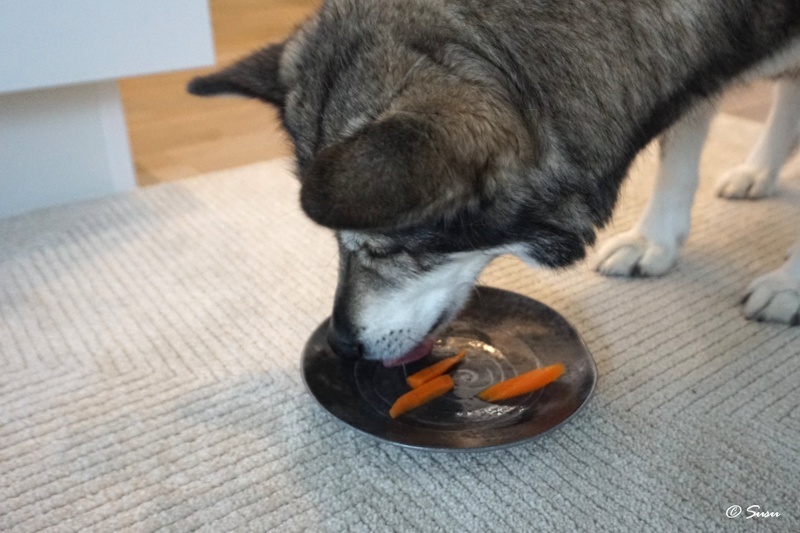 Most dogs like vegetables and some fruits. Miki loves boiled carrot, sweet potato, broccoli, cabbage and many more vegetables. Obesity in dogs is also a great problem so why not provide a low fat vegatable treat for your dog every now and then? 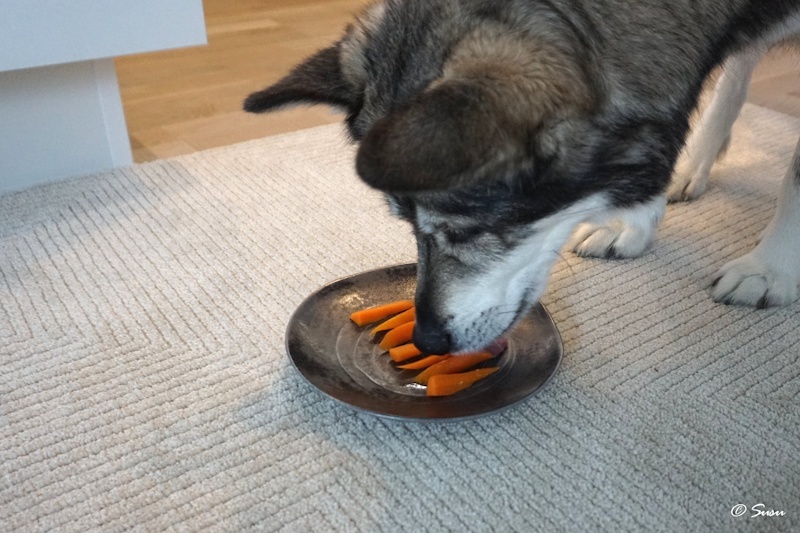 I always have some prepared vegetables for Miki in the fridge, so at late evenings when Miki is still hungry after his dinner I give him some vegetables because they won’t make him fat. You can try variety of different vegetables to find out what your dog likes, but remember to boil root vegetables first so they won’t clog your dog’s bowels. If you are unsure what you can or can’t feed to your dog you can check it here. Every now and then all of us feel small. You may think that one small choice is not going to rock the boat in one way or another. Or that my share is so tiny that my choices won’t make a difference. You should remember, that the only way to make a difference is by choosing. By changing red meat to poultry you can cut your dog’s emissions and by choosing a vegan dinner for yourself instead of meat even every now and then you can make a huge difference. If you don’t make the difference then who will? If one person thinks they can’t make difference, multiply that by a thousand or by a hundred thousand. That makes a difference! Remember, many small streams make one big river.